The best part about Homey is the fact that you can connect all your devices to each other. People usually tend to think that we’re talking about connecting expensive lights and sound systems, but it’s way more basic than that – and way less expensive. We always like a good bargain (we’re Dutch after all!) so let’s talk about some simple, effective and cheap ways make your own smart home. A simple door/window sensor goes a long way in terms of functionality. And with prices varying from €19,- to €55,- they’re not too expensive, either. Do you have teenage kids that want to stay out late? And you don’t want to stay up to check if they made their curfew? Create a Flow that sends you a push notification to your smartphone when somebody comes through the door at night. Of course, this also works with burglars. If somebody tries to enter your home in the middle of the night, you’ll always get notified. No expensive alarm system required, just a contact sensor and your Homey. Ever thought about placing sensors on your fridge? We do this at our office. Every now and again we get together with colleagues and have a drink. Whenever the time is ripe, and somebody opens our beer fridge, Homey will let everybody in the office know by saying ‘Ha, beer!’*. Signalling our hardworking developers that it’s time to relax a little and kick back with a cold one. *Of course, you can add other sounds as well with the Homey Soundboard App. 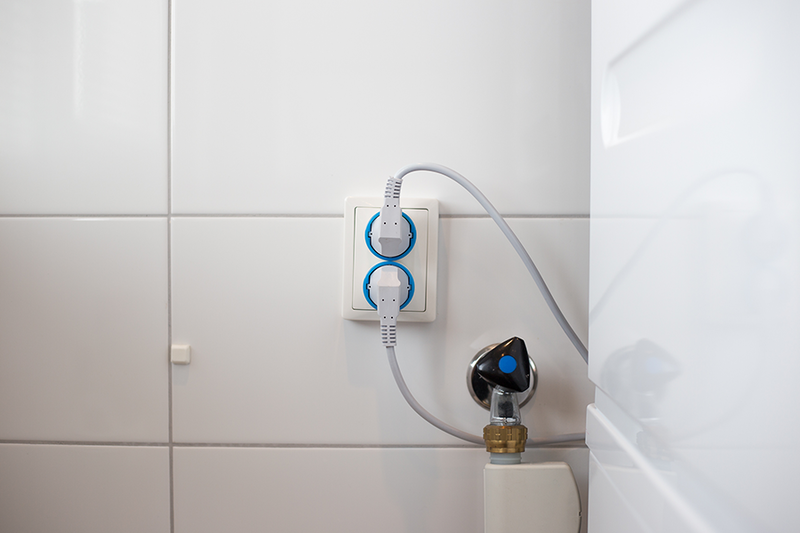 Do you have smart wall plugs, and don’t know what to do with them? Let’s paint a picture. Your beloved son comes home from a night out, and decides he wants to eat something. He turns on the frying pan. It takes a while to heat up, and your son falls asleep. Instead of – worst case scenario – burning down your house, make a simple Flow that automatically turns off your frying pan 30 minutes after it’s turned on. That way you’ll be guaranteed some much deserved peace. Of course, this isn’t limited to just frying pans. Analogue devices (devices with a simple on- and off switch), can easily be controlled with a wall plug and your Homey Smartphone App. Turn on your kettle with your phone, control your fan or AC unit and much more. Do you know the feeling when you’re waiting for your washer or dishwasher to finish? Walking up and down the stairs to see if you can take out your laundry, or constantly listening whether or not your dishwasher is still on. Want to make your house into an actual smart home? By adding smart sockets to your major appliances Homey will send a push notification to your smartphone when they’ve done their work. Or send the notifications to your kids, so they know they have to clear out the dishwasher. Also, put Energy Usage Flows to use and let Homey notify you to turn on devices. Motion sensor lights are already pretty well known: you set foot into a specific room and the lights turn on. However, when you need to go to the bathroom in the middle of the night, you’re not always looking to be blinded by a bunch of bright lights shining in your face. By making a simple Flow you can adjust your hallway light to light up with 20% brightness (for example) during the nighttime, while shining bright during the day. This way your hallway is always lit correctly, ensuring you can go back to sleep easily. Smart lights are dimmable, so make your own motion sensor lights with – for example – the IKEA Trådfri or Philips Hue lightbulbs you already have. You can create your own smart home whichever way you like. Fascinated by the possibilities? Learn more about Homey.